Ryman Auditorium, the Mother Church Of Country Music and the home of the Grand Ole Opry from 1943 to 1974, is sacred to the history of country music. Vince Gill kicks off the 2014 series June 26th at the famed Ryman Auditorium. Vince has been a regular on the series and with his long list of achievements in many styles, this is sure to be a top act and a fine way to start off the Thursday evening concerts. On July 10th, Jim Lauderdale joins the Steep Canyon Rangers. The Rangers have been extremely popular with Steve Martin joining them. 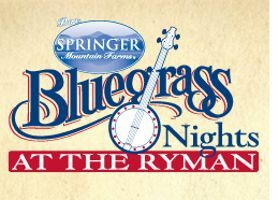 At this Bluegrass Nights at the Ryman, Jim Lauderdale will also be performing. This should be a very entertaining performance. Multi award winning Dailey and Vincent will perform their hot bluegrass licks on July 17th. Dailey & Vincent is one of the top Bluegrass bands in America. From the very beginning of their partnership in late 2007, Jamie Dailey and Darrin Vincent quickly established themselves as fresh voices in their genre. The concoction of their fantastically powerful vocal blends, 4 award-winning studio albums, and heavy touring schedules has gained them well-deserved attention from bluegrass, country, and gospel critics and fans alike. The Earls of Leicester, featuring Jerry Douglas, Shawn Camp, Johnny Warren, Charlie Cushman, Barry Bales and Tim O'Brien are a group of like-minded musicians banding together to recreate the wonderful music of Lester Flatt and Earl Scruggs and the Foggy Mountain Boys. Led by thirteen-time Grammy-winner Jerry Douglas, The Earls of Leicester features the talents of some of Nashville's most talented musicians, including hit songwriter Shawn Camp on guitar and lead vocals, Tim O'Brien on mandollin, bassist Barry Bales (Douglas's cohort in Alison Krauss & Union Station), fiddler Johnny Warren (son of Paul Warren, legendary fiddle player in Flatt & Scruggs' Foggy Mountain Boys band), and acclaimed banjo player Charlie Cushman. A life full of music. That's the story of Ricky Skaggs who takes the stage July 31st. By age twenty-one, he was already considered a "recognized master" of one of America's most demanding art forms, but his career took him in other directions, catapulting him to popularity and success in the mainstream of country music. His life's path has taken him to various musical genres, from where it all began in bluegrass music, to striking out on new musical journeys, while still leaving his musical roots intact. The series takes place Thursday nights at 7:30 PM at the Ryman Auditorium in Nashville, Tennessee. Tickets are available at the Ryman, the Grand Ole Opry and on www.ryman.com.